Indonesia’s PT Diamond Cold Storage has introduced a new range of premium pasteurised milk under the Brookfarm range. The 1,000ml milk is made from 100% imported milk from Australia. IDR/RM exchange rate at 0.00028. Store check at Hypermart, Jakarta in December 2014. Greenfields, Indomilk and Diamond are based on promotion price. What is interesting about this fresh milk is it fetches a very high premium relative to other local fresh milk. Brookfarm is 162% more expensive than the Diamond fresh milk made by the same company. As a comparison, popular fresh milk sold in Malaysia does not offer such a wide price gap. The maximum is about 50% (Pura Low Fat Milk vs Auselect). If Brookfarm is targeted at the expat community or high-end consumers, it is natural to see it being made available at high-end residential/commercial areas such as in Central Jakarta. However, Brookfarm can be found in Hypermart in Gajah Mada Plaza, a middle class shopping mall. 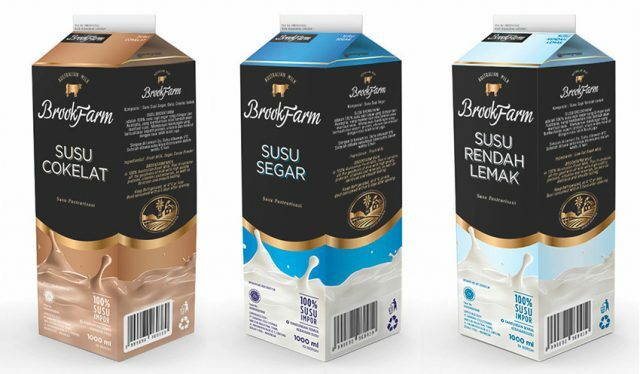 Perhaps Brookfarm is a strategy by Diamond to capture a share of the premium pasteurised fresh milk market before serious competition from imports emerges. This looks very interesting. I am lactose-intolerant though. Would they also be coming out with susu kedelai or other cereal milk? "Milko" has listed "skim milk" as one of its ingredients. Please check if you are lactose-intolerant. is brookfarm milks comes from grass fed cow? I just can't find the source or their web, all i can find is only the diamond official web (the importer to indonesia) which didn't explain about that at all.